"Trustful" ME 132 was next registered to my father as owner in April 1967. My father sold the boat to Peter Abernethy in 1974 : he is registered as owner in April 1975. There is a note appended referring to the closing of the Registry in October 1975 on transfer of Registry to Aberdeen. 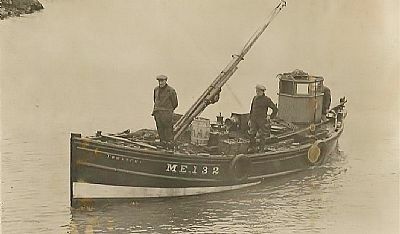 Pictured- at the stem, probably Big John, John Mowatt, my father’s maternal uncle - amidships – James (Jeems) Craig, my father’s eldest brother, and in the wheelhouse, either Adam Craig, my grandfather or Willie Craig, brother to Alex, Jeems and Joseph. In later life the Trustful had no wheehouse.